KSiteTV's Craig Byrne reviews the Vixen: The Movie Blu-ray release. 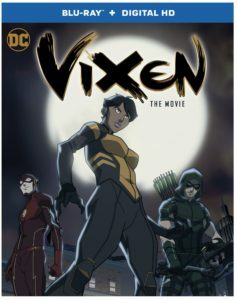 Vixen: The Movie, containing the Arrowverse CW Seed video shorts and combining them into one feature-length story, was released by Warner Bros. Home Entertainment in late May. Unfortunately, the Blu-ray player here at KSiteTV Central died and we’re only just now able to post a review. But now… here it is! Our apologies for the delay. Before we cut into the review, here’s how the release is described. Order yours from Amazon.com and support KSiteTV! VIXEN: The Movie combines the first two seasons of the CW Seed digital series into a single uniform story and includes 15 minutes of all-new, never-before-seen content. The special features include a brand new featurette and two Vixen-focused episodes of Justice League Unlimited handpicked by super hero animation icon Bruce Timm. As for the continuity of it all, the first half features Barry Allen’s original chest emblem as The Flash so I’m imagining it takes place during Flash Season 1. The second half is a little trickier: Firestorm has his costume from DC’s Legends of Tomorrow, yet he and Ray Palmer/The Atom are both on Earth. Yet, Laurel Lance/Black Canary is still alive, and Oliver Queen is running for Mayor. I’m assuming that places “Season 2” or the second half of the movie as being during Arrow Season 4, after Ray Palmer’s “return” but before the Legends went off on the Waverider. Beyond that, there are things I’m forgetting; for example, when Martin Stein, Jax, and Ray Palmer met Amaya, Vixen’s grandmother, did they ever note the connection that they met Mari? Will we ever see a “Vixens” episode of Legends? How, why, and when did Amaya’s family end up in Africa? So many questions we’re probably not supposed to think much about. I admit, I always thought Mari McCabe (Megalyn EK) would be great for a series of her own, but with soon to be 5 DC shows (not even counting iZombie) on The CW, I guess that’s not going to happen. Shame, because it’s a great character with a great backstory. At least we have this very well-animated feature. Picture & Sound: It sounds great, but honestly, there’s no real reason to put something animated like this on Blu-ray. I don’t think the enhanced picture really makes a difference; it’ll look great either way. The Packaging: I like the cover art, which also brings attention to the appearances of Green Arrow and The Flash. The Extras: In addition to two classic Justice League Unlimited episodes featuring Vixen, there’s a documentary about the Vixen featuring several creative talents and voice cast involved with this project. Sadly, no Gerry Conway interview, which would have been really fascinating. Oh, and I cringed when one of my favorite Flash actors was listed as “Carlos Valdez” on the chyron. You put together a great feature, now spell the names right. Is It Worth It? Absolutely. Again, so much better than watching it in chunks, and it’s kind of like a bonus/extra Arrowverse adventure. Can’t go wrong there! Order yours from Amazon.com and get this movie at a discounted price!